Video converters are a lot less needed these days than they were before. You still need to convert media files if you want to sync your iPhone via iTunes. But at least on Android, you can play any video in any format without having to first convert it into an MP4 video. But that does not in any way make video converters obsolete. Professionals will still always need such tools. Most of the time though, you will end up using a software dedicated to video editing, and then another to convert the video, another to download a video, etc. But what if there was a software that could do all these things? This is where iSkysoft iMedia Converter comes in. Processor: > 750MHz Intel or AMD CPU. Free Hard Disk Space: 100 MB or more. CPU: 1G Hz Intel processor or above. iMedia Converter Deluxe features an easy-to-use drag-and-drop interface that should seem familiar if you have used any other paid media converter before. In fact, the UI reminds very much of another media converter we reviewed at DroidViews. Video/Audio files can be loaded by simply dragging them to the blank space in the window or by clicking the Add Files button in the top left. Once you’ve added the files, they should appear in the window. A sidebar contains the various conversion options that you can choose from. Once you have your media loaded up, select one of the available formats from the side and click on the green button in the bottom right corner that says Convert. The conversion speeds are pretty good. I was able to convert a 4 minute 17 seconds long 480p video into a high-quality 256kbps MP3 file within 10 seconds. Standard Video Formats: AVI, MP4, MPG, MPEG, MKV, MOD, TOD, WMV, DV, ASF, RM, RMVB, M4V, TIVO, DPG, VOB, 3GP, 3G2, DAT, MOV, FLV, F4V, DVR-MS, GIF, AP3, AIF, NUT, NSV, WebM supported input/output formats. HD Video Formats: MTS, TS, M2TS, TOD, HD WMV, HD MKV, TP, TRP, HD MOD, HD MOV, HD FLV. DVD Formats: DVD disc, DVD ISO file, DVD folders, DVD IFO file. Audio Formats: MP3, M4A, WMA, WAV, OGG, AC3, AAC, AIFF, FLAC, APE, MKA, AU, M4B, M4R, AA, AAX, M4P. Devices: HTC Vive, Oculus Rift, Gear VR, Apple TV, iPad, iPhone, Android, Kindle, PlayStation, Xbox, Nintendo Wii. Alongside, it can also convert videos to 3D MP4, 3D MOV, and 3D MKV formats. Of course, this will take more time than usual. 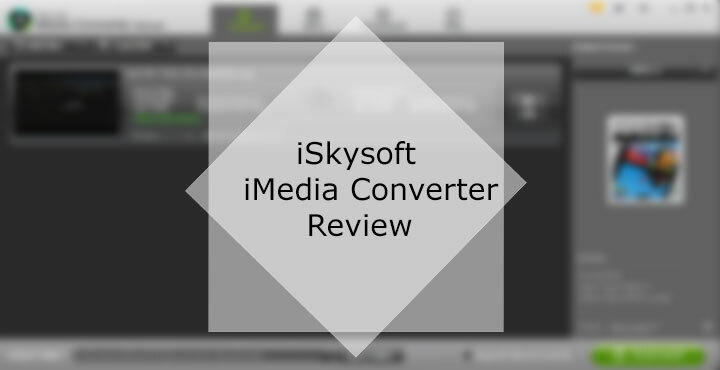 As said earlier, iSkysoft iMedia Converter is not just a video converter. Along with that, it also lets you download videos from online sources such as YouTube. The support for downloading online videos extends to Facebook, DailyMotion, Metacafe and over 1000+ other websites. To download a video, head over to the Download tab and click on Add URL. The handy “Paste URL” option automatically pastes the link from the clipboard, and you just have to click to initiate the download. You can also select a video format to save the video in that format before starting the download. The video will first be downloaded and then converted before saving. There is also a pause/resume option if you’re on a sketchy network. The YouTube to MP3 option allows you to download only the audio part of a YouTube video as an MP3. The “Turbo Mode” accelerates download speeds, but is available only to registered users. iMedia converter also has extensions for popular browsers like Chrome, Firefox, and Safari to help breeze through the online video download process. Video Mode: Normal, Stereo, 180°, 360°. Video trim: Trim video from the start time to the end time. Adjust Video: Crop and change the aspect ratio, change orientation and flip video horizontally or vertically. Deinterlacing is also supported, so you can convert an interlaced video, such as common analog television signals or 1080i format HDTV signals, which is a non-interlaced form. Video Effects: Adjust volume, brightness, contrast, saturation and apply from pre-defined filters like tinted, old-film, grayscale, etc. 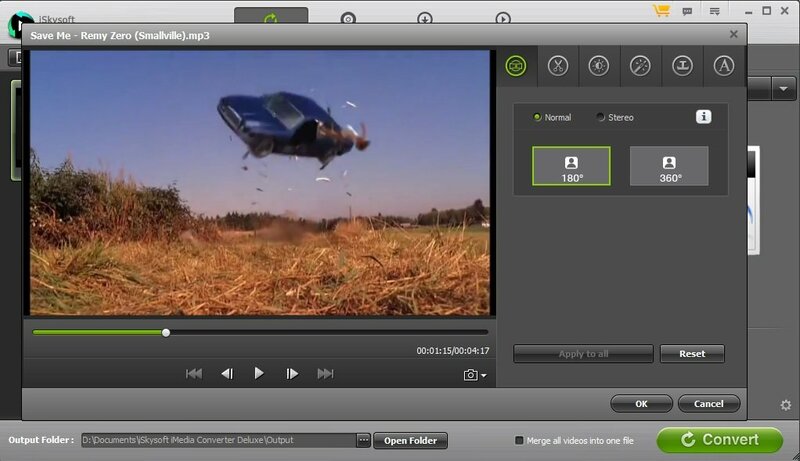 Watermark: Add a text or an image-based watermark and set its transparency throughout the video. Subtitle: Encode a subtitle with a font of your choice and set its desired position in the video. Convert DVD: iMedia Converter Deluxe can help you convert your DVD to a compatible format so you can play them on any device of your choice. Burn DVD: Easily import and burn multimedia files on your DVD. Other than those, you can perform the standard tasks such as DVD backup, and edit a video before burning it to the DVD. iSkysoft iMedia Converter does what it sets out to do. It’s a neat and good enough video converter, a video downloader and a DVD burner. The pricing is also similar to what others are offering. There’s nothing to boast about it, but that’s not necessarily a negative. The Lifetime license is actually a bit cheaper compared to others, so if you are considering a lifetime license, it’s a good deal. If you need a family plan though, check out our review of Video Converter Ultimate which is quite cheaper when it comes to a family license and is more or less the same as this one.